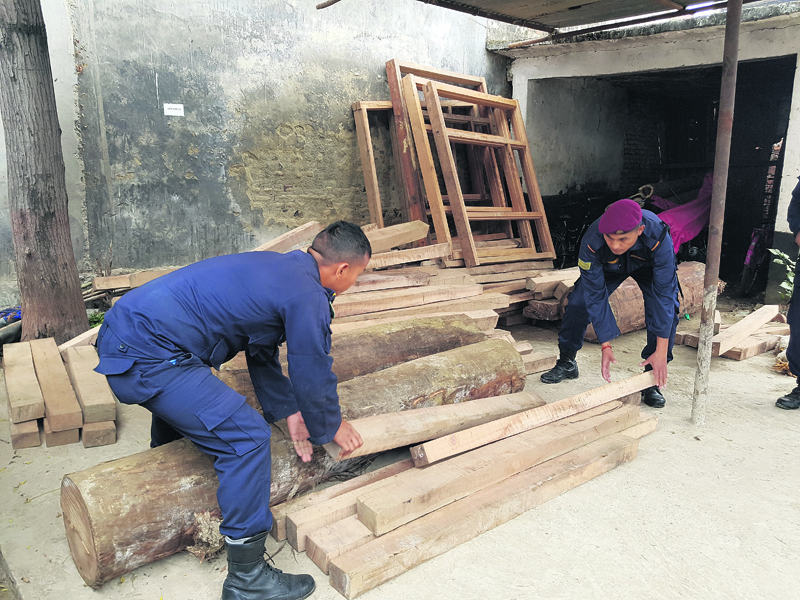 Timber imported illegally from India confiscated by the police in Nepalgunj on Wednesday. NEPALGUNJ, Jan 5: Police have confiscated a large amount of timber from the house of Brij Lal Loniya, a local of Nepalgunj. Acting on a tip off, a team of police had reached the place on Wednesday morning to inspect suspicious activities. The police confiscated 93 logs of sal tree and three other logs from the site. After confiscating the wood, police also raided the house of Ram Prit Loniya and successfully confiscated 40 logs and dozens of window frames. Lohiya was arrested on charge of smuggling wood while two others, Jabbar and Brij Lal, involved in the smuggling are at large, informed Police Inspector Rajendra Gautam. “It seems like these timber have been smuggled from border areas,” Gautam said. Earlier on Tuesday, a large number of timber brought from Hiramoniya of Banke was confiscated from the Khans Saw Mill of Bulbuliya, Nepalgunj. Similarly, a local Shani Shekh, 19; Mata Prasad Goriya, the manager of the mill and the mill's guard Barati Godiya, 60, have been arrested for their involvement in the illegal activity. Other suspects are yet to be arrested by the police. The smugglers have been selling timber illegally to DK Furniture owned by Dilip Khadka of Bulbulaiya and Khans Mill operated by Satar Khan. Police confiscated three Pulsar bikes with Indian number plates 40 AF 1149, UP 43 J 9997 and UP 40 K 7272 from the arrested people. According to the police, a group of people carry the timber from India to the border charging Rs2,500 per cubic feet. Then, another group carries them to DK Furniture and Khans Mill on their bikes charging Rs 3,500 per cubic feet. Smugglers have been influencing the security guards at the border areas to import the wood illegally. Despite best efforts by Nepal Police, it has not been able to completely curb this problem from the border areas. 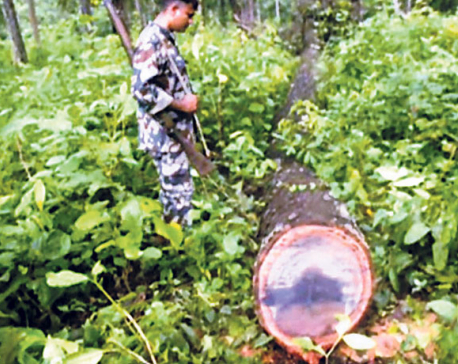 Pushparaj Bartaula, a forest official, thinks that the security system in the border is very weak because of which it has become easy for smugglers to import timber illegally to Nepal from India. “We have time and again raised this problem in the meeting with the forest officials of India but we have not received the expected attention from the Seema Suraksha Bal (SSB),” said Bartaula. DSP Tek Prasad Rai, chief of the District Police Office, Banke informed that they have already started a campaign to find out the network of these smugglers.